My name is Samuel Constante, I was born in San Luis Potosi, Mexico, the only sport I’ve ever played is soccer, I guess I was good enough that at age 13 got drafted by the “Santos de San Luis to play in their under 15 team, but I gave it up because I wanted to try basketball (big fail there) when I was 16 my dad decided we were moving to the great nation of Texas, where I finished HS and after that I got my degree as a minister. I have an amazing wife, We’ve been married for 15 years, got 2 kids a girl who is 12, and a boy who is 8, and Duke my 135 lb great Dane. 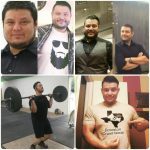 After I had lost 35 lbs by running, I began to crave something different, because I was getting bored with running, so I thought about giving CrossFit another chance(the first time I had a very bad experience at a different box.) so I came to CF3040 with low expectation, thinking it was probably not going to workout. But I didn’t want to do the typical gym thing. So I gave CrossFit another chance. I would say it is “Grace” because you just have to go for it and not think about it.